Hello again, lovelies! I hope you all had a wonderful Turkey Day. Mine was uneventful, which is never really a bad thing, haha. I have some taupey browns for you today, since taupe is very popular this time of year. Let’s get into it! Well clearly I’ve hired some sort of wizard to magic me up some fancy long nails. Or I had a several-week-long stint where I was wearing falsies, particularly these ones by Kiss which are super easy to shape and apply. But I digress! The color I’m sporting here is Essie Mink Muffs, which is a yummy, chocolatey taupe brown – it’s honestly the exact color of hot chocolate. I felt so classy and feminine wearing this! I never wear browns but this one has me hooked, possibly because I have a crippling chocolate addiction that this color appeals to. This is two easy coats here. And here on my much shorter, natural nails, I have the classic taupe brown OPI You Don’t Know Jacques. It’s a lot more mushroomy gray toned than Mink Muffs. I’m going to admit that I didn’t love how this one looked on my nails, despite it being so similar to Mink Muffs. Maybe the fact that it’s less vibrant made it look muddy against my skin tone? Who knows. Two coats here as well. That’s it for today. How do you guys feel about taupes and browns? They’re kind of polarizing, so it’s always fun to see what people think. This is Femme Fatale Falling Embers, available exclusively through US stockist Beautometry. It’s a purple jelly base brimming with copper shimmer and some sparse holographic particles. Also I’m in love with her, gosh. I forget if I used two or three coats here, but the base is slightly sheer so you’ll probably need three. Three coats that are totally worth it. And this is Femme Fatale The Secret of Secrets, a taupe base with gold shimmer, holographic particles and opaque multichrome flakies. I used three coats for full opacity. I’ve really liked Femme Fatale’s polishes from afar for a long time because of how complex and unique they are, so it’s nice to finally have a few in my hands (including Lantern Wastes which is both beautiful and no longer available—nyeh heh heh). If you’re in Australia, you can get ‘em from Femme Fatale’s website, and if you’re not, you can get them from any of the stockists listed all the way at the bottom of the front page. I don’t know about you, but I’m stuffed. Today is Thanksgiving, and you know what that means – it means that I’m posting mani pics instead of spending time with my family, naturally. Only because festivities haven’t started yet, of course! Nine Zero Lacquer is a new to me brand, although I’ve been subscribed to proprietor Jess’s YouTube channel for a while now. This is one third of her Thanksgiving trio, Stuffed. Stuffed is, well, stuffed with gold holographic microglitter, with red, orange, burgundy-ish and bronzey glitters interspersed within. And holy cow, it actually looks like turkey stuffing—sparkly, sparkly turkey stuffing. I’m in love with this. I used one thin coat to start, applied a generous second coat, and then just did spot coverage to spare a third coat. It makes more sense to sponge this on—I opted not to because I used liquid latex as a base coat, and so risked taking the whole manicure off if I put liquid latex around my cuticles for easy clean-up after sponging. I do not want to have to soak this all off with acetone!! Also, you’ll want a coat of Gelous under your topcoat to get this smooth. Thanks for reading, and happy Turkey Day! These will do for now. Why don’t I have more Orly polishes? They’re great. I think they often go overlooked because they’re not considered high-end like OPI, but they’re good quality. I do intend to reswatch this in the future, when I’m not sporting nubs. Fantasea can get mostly opaque in three coats, or you can layer it—I have it layered over Ciaté Burlesque, a dark blue-toned eggplant purple. Orly Ingenue, however, you can get opaque in two. It’s a pinky-purple base with gallons of gold shimmer, in that same sort of chameleon-y vein as Fantasea. I think this could totally work as a fall color, come to think of it. I’ve managed to dupe not just a single polish, but an entire manicure. You might recall the time I swatched Girly Bits Shift Happens layered over China Glaze I Sea The Point. Turns out that Sally Hansen In Prompt Blue is a dupe for I Sea The Point… Both are a slightly dusty ocean blue color, both cover in one coat. And Starlight Polish Dragon is a green-yellow-gold-orange shifting counterpart to Shift Happens’ red-gold-green shift. Did any of that make sense? Is my grammar okay? English majors, help me out here, I’m terrible at explaining things. Anyways. Let me talk about Dragon for a moment. It’s a green-based shifting topcoat, and while I love Shift Happens, I find that Dragon looks way better over blue than SH does. And Dragon is essentially a topcoat version of Starlight and Sparkles Dragon Scales, which is also amazing. Basically what I’m saying is that you should just go over to Issa’s shop and buy everything because holy cow her polishes are beautiful. What are you waiting for??? Go!! This brand was fairly new back when I purchased these, over a year ago… Now, not so much. I’m wearing two polishes by Golden Rose here, Golden Rose Color Expert 28 (they only have numbers, no names) as my main mani and Golden Rose Jolly Jewels 112 as my glitter tips and accent nail. 28 is a red-toned plum color with slight blue shimmer (it’s never as apparent in real life as it is under the camera flash though unfortunately). 112 is a glitter topper with lilac microglitter, two different sizes of small silver hex glitters, and a very slight purple shimmer in the base. 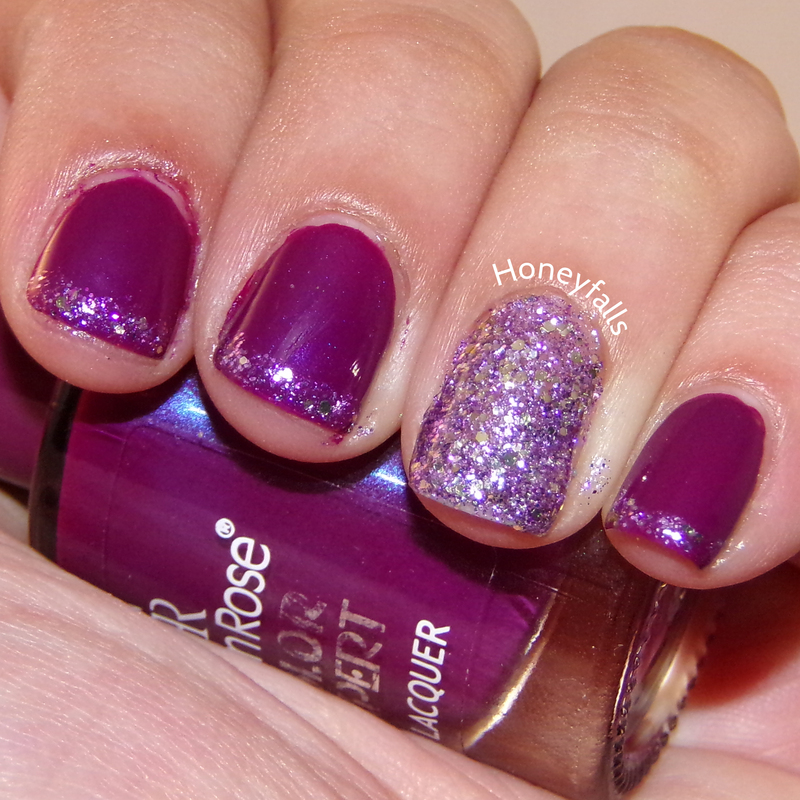 I wasn’t surprised that the 28, the purple, was opaque in two coats, but I was surprised that 112, the glitter, was! It has amazing coverage and isn’t base heavy at all, and while you could sponge it on, you really don’t need to; two or three coats will have you covered. No pun intended.